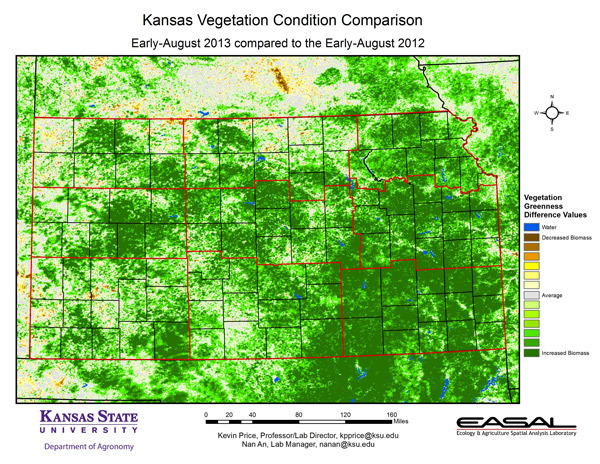 This map came from Kansas State University in a newsletter where they were talking about the vegetation differences from the Drought of 2012 to 2013 in Kansas. A colleague shared this with me pointing out how obvious the storm in Clay County, NE is on this map. Look above Kansas to the brown area-that’s the LOSS of vegetation we have right now in Clay County which is quite extensive-and neat how it’s captured unexpectedly on this map. Posted on August 29, 2013, in Crop Updates, Drought, Event, Storm Damage and tagged Agriculture, Extension, farm, farming, loss, Nebraska, satellite maps, storm damage, vegetation loss, visual. Bookmark the permalink. 1 Comment.